On to the next one! 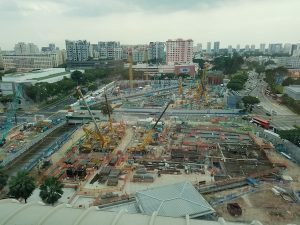 The next project on the GLCM’s list was the Paya Lebar Quarter, a mixed used development project being developed, constructed, and managed by the one and only, Lendlease in a joint venture with Abu Dhabi Investment Authority (ADIA). The GLCM squad trudged forward in the 93-degree Singaporean weather in hopes to find some AC. Sure enough; we were welcomed with open arms and cool air at the Lendlease temporary office by Construction Director Kip Hayes, Commercial/Development Director Lisa Gledhill, Design Manager Danielle Nesbitt, and Development Executive Sarah Tan. 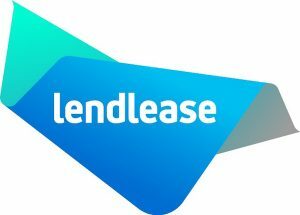 Lendlease is an international developer with a strong track record of urban regeneration projects around the world. Urban regeneration, as its name suggests, is basically the renewal of areas that are declining both physically and economically. Projects such as this are meant to revitalize the local economy and enhance the local community. Paya Lebar Quarter will transfer the local area into a Òvibrant, pedestrian friendly city precinct. Paya Lebar Quarter is a 99-year leasehold mixed-use development project located in Paya Lebar, one of the main urban planning and census divisions of Singapore. It consists of seven buildings; three of those buildings are office towers with close to 1M square feet of best-in-class office space. Interior build out of the office space is not within LendleaseÕs scope but occasionally will bid the fit-out for major tenants. Also included is a standalone mid-sized retail mall with over 340,000 square feet of shopping, dining, and entertainment space. The final 3 buildings are residential towers, which in total include 429 apartments. 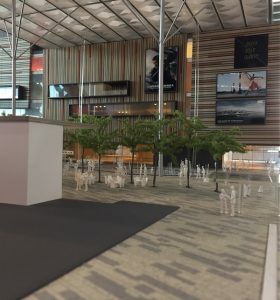 At only 15 minutes away from the Changi Airport and adjacent to an MRT station, the Paya Lebar Quarter is expected to reinvigorate the area with visitors and tourists.The Lendlease team then took us to the theater to watch a movie before the job site tour. Just kidding! The picture above is actually of one of the physical models of the final design. Needless to say, the GLCM team was incredibly impressed by the amount of detail that went into the model. The team marveled at this model and a few others before continuing our discussion of the project over a nice lunch. But what is a project without its challenges? During design, the buildings were constrained by limited lot area and height restrictions due to its proximity to the airport. In addition, existing soil was of poor quality and so remediation via cement stabilization was required before commencement of the caisson and foundation work. Another major challenge was the discovery of existing sheet pile walls from previous building. Lendlease was able to overcome this challenge by staggering the excavation sequence. 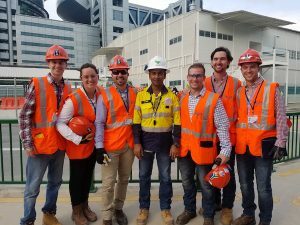 The GLCM team then ventured outside to the heat in PPE for the job site tour. 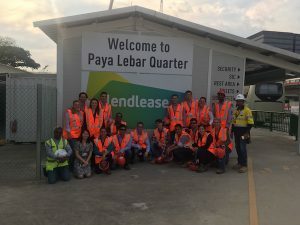 Lendlease split us up into three teams of about six each as we explored the rebar jungle. A safety manager by the name of Najmul taught our group about core slip form systems, concrete piles, soil remediation, and many more construction processes. Next, the GLCM team went back into the office to discuss the use of building information modeling. Don Carlo and Siti from the BIM team led the presentation about LendleaseÕs use of Revit&Navisworks to ease construction through 4D-integrated models. 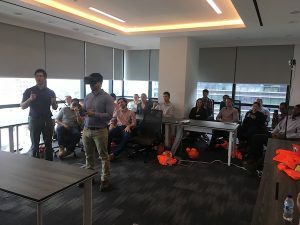 Specifically, we learned about the use of virtual reality in construction and development. 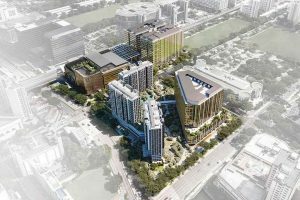 Lendlease is currently exploring this technology track progress, point out safety issues, and present potential clients with a virtual view of potential apartment/retail space. A few of us got to try the Oculus VR headset. The rest of the group chuckled as they walked, jumped, and avoided obstacles in the virtual world. The visit concluded with a final discussion about sustainable building in Singapore led by Michelle Lee, the sustainability director. Singapore uses a similar system to LEED in the U.S called Green Mark, which is mandated by the government and provides incentives such as increased allowed gross floor area upon certification. 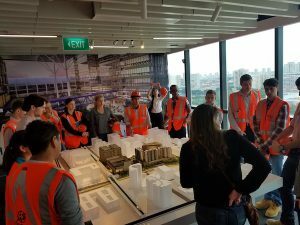 The GLCM group learned about Singapore’s transition to sustainable building and the government’s involvement in the whole process of green building. Danielle Nesbitt then rejoined the group to bid us farewell. After nearly ten years of working with Lendlease, four of which were in Singapore, she will be joining the Lendlease team in Chicago in March. A couple of Lendlease hires in the group will be happy to see a familiar face upon beginning work this summer! And with that, #GLCMtosing has concluded. Next up: Kuala Lumpur in Malaysia for more construction visits, sun, and Asian cuisine.